Sheesh, the euro-types have given Greece a going-over. If those perennial fudgers and compromisers are willing to go as far as that, Tsipras clearly overplayed his hand catastrophically (and of course got right up their noses at a personal level). Can it possibly stick? - there's such a thing as a deal that is too good for its own good. Anyhow, to the history books. 5th-century Athens bore some resemblance to 21st-C Brussels, the hub of a semi-imperial set-up, administering a more-or-less compliant collection of diverse and once-proudly-independent city-states and regional entities. Some they had taken by conquest, others had originally been fellow members of the Delian League before it morphed into the Athenian pseudo-empire. In any event they were pretty much obliged to accommodate the wishes of Athens which, for its part, was bluntly guided by its own self-interest, sometimes far-sighted and moderately enlightened, sometimes less so. Melos was an island which sought to persuade Athens not to enforce punitive levels of tribute. A debate ensued: the famous Melian Dialogue, as written up by Thucydides, which starts off with some fairly even-tempered exchanges, the Melians attempting to achieve their goals by rational argument, the Athenians courteously responding - giving details - that they didn't see it that way. The Melians should have known. Although by that time Athens was a democracy (of sorts), and public morality was evolving towards something we'd recognise in the Judeo-Christian tradition, the massive residual influence of the Homeric tradition was still out there. Homeric morality is simple: only one thing counts, and that is Results. How you achieve them may be more or less decorous, but a successful Result trumps all nicer considerations and finer feelings. Initially the results in question were to the benefit of a noble family, later to a city-state, and later still by extension to a wider civic entity. As the Athenian empire became more complex, it became ever more difficult to determine what exactly was in its best interests (the birth of politics and the rise of the esteemed counsellor alongside the great warrior): but that's not the point. Tsipras and his chums are Marxists, or so we are told. Greek Marxists, of all people, ought to have a clear historical perspective on this stuff. Apparently not: and now his people will be getting the Melian treatment in no uncertain terms. What price a classical education, eh? And those Persians have never been much help either. The EU basically is an empire. Arguably a voluntary, quasi-democratic empire, bu an empire nonetheless. Oh, wouldn't it have been so much better if the glorious founding fathers of the Euro had not tried to force the issue? If we'd had a "hard Ecu" which may or may not have encouraged convergience on national, democratic terms? On a minor factual level Greece is corrupt, and shouldn't have borrowed so much, but also the lenders should have done their due diligence. Having said that the misery created in Greece is so severe that the will to power of the euro elites is a wonder to behold. Cameron hasn't got a hope in hell against that lot - they will run rings round him. Do to his blindness we will probably be trapped in the EU, and because that is incompatible with freely trading around the world, do less well economically than we could have. As well as no longer being sovereign. German mercantilism has reduced Greece to a province of Greater Germany. This is our fate too if we stay in the EU, despite our size. We still (just) have a choice: do we want the UK; or do we want the EU/EZ? Because recent events show it is no longer possible to be the UK within the EU. "Nobel economist Paul Krugman says the EMU demands are “madness” on every level. “What we’ve learned these past couple of weeks is that being a member of the eurozone means that the creditors can destroy your economy if you step out of line. This has no bearing at all on the underlying economics of austerity,” he said. “This goes beyond harsh into pure vindictiveness, complete destruction of national sovereignty, and no hope of relief. It is, presumably, meant to be an offer Greece can’t accept; but even so, it’s a grotesque betrayal of everything the European project was supposed to stand for,” he said." And so; Greece has been bought, in a currency that has only existed for a mere 15 years of its long proud history. Lined up for asset stripping, its resources secured for the elites in the guise of the "institutions". Its new feudal overlords wait in the wings. 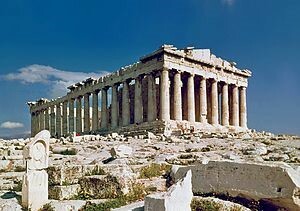 Greece is history. A victim of western "civilisation" and financial terrorists. This is not really different from the International Committee for Greek Debt Management in 1898 imposed on Greece after the country went bankrupt following a disastrous Balkan war. A six-power league of bondholders, led by British bankers, impounded customs duties in the Port of Piraeus, and seized revenues from stamp duty, tobacco, salt, kerosene, all the way down to playing cards. But at least there was no humbug about solidarity and helping Greece on that occasion. I hope the Greek parliament is sensible enough to vote it down; I doubt it though. THE EU looks more like something fro. @984 every day. The EU still seems to be under the bizarre delusion that Greece can ever repay this debt. It is an external debt, and is 5 times bigger than the total exports of Greece. It would have been impossible to repay even before 28% of the population were thrown out of work. It would be impossible to pay even if Greece was running a massive trade deficit. Why do they insist on referring to these payments as "bailouts"? There is no bailout. They are simply rolling over the debt with the interest and adding more interest on top. The Germans are up in arms about paying for some Greeks to retire at 50 - but it isn't as if they have any job to go to anyway. If you want people to repay their debts surely you need to at least set them to work? So we are going to have a situation where the creditor nations (primarily Germany) will send their representatives to watch over the Greeks while they stump up some cash. Why don't the EU just call these representatives "Governors" and be done with it? The fact is that these German governors will find themselves just a tad unpopular when the cash is paid but the debt continues to get bigger while food becomes scarce, the tourist industry collapses and the healthcare system runs out of drugs. It seems to me that their are two parties to this debt - the loan shark and the bad debtor. Both are equally to blame, but only one side has paid the high price. How long before a terrorist group calling itself something like "The Greek Liberation Organisation" starts detonating car-bombs in Brussels and Frankfurt? This is not going to end well at all. Somebody desperately needs to tell the EU to get a grip. Can it really be long before the Americans humiliate the EU by stepping in and sorting out some kind of solution? Because right now we don't have a solution, we have the seeds of war. Not, perhaps, conventional war, but the kind of asymmetric warfare that has become all too familiar. How long before ... "The Greek Liberation Organisation"
Dearieme said: "The Blessed Ambrose also said: ...." I actually quoted Paul Krugman, though I do agree with the general tenor of A E-P's article. What has emerged clearly is that since the EU elites have treated a "friend" in such a manner, they will be prepared to behave towards the UK in the same way. This should lift the veil of illusion that currently blinds not just europhiles, but also those Tories who think they can do an advantageous deal with the EU. 'Governor'? I think the Germans once had a word for it. What was it again, ga... gau...gaul...? something along those lines. Lots of extreme-left Greek terrorism - the last attack being the shooting dead of two Golden Dawn members eighteen months ago (NOT followed by the arrest of the various extreme-left leaderships, a contrast to what happened when GD members stabbed a man to death). Must say I'd never heard of Sokratis Giolias. He certainly didn't get the Anna Politkovskaya treatment. Mexico top by a mile, then USA (mostly killed overseas), Russia, Sri Lanka, Turkey, Italy, France, Pakistan. Sri Lanka I'd imagine mostly state-sponsored, Mexico gang-sponsored - though in Mexico, Russia, Italy, maybe France, Turkey, maybe Pakistan it might be hard to separate some layers of government from the gangsters. If the Melian precedent is followed, all the Greek men will be slaughtered and the women and children sold into slavery. Who will buy them... the Turks?